Trump appears unaware of either the “strength” of the US arsenal, or that much of the world actually is coming to its senses regarding nuclear weapons. Mr. Trump either knows almost nothing about nuclear weapons—and broadcasts nonsense about them—or he wants to distract attention from current progress being made toward their abolition, or both. The same day as his H-bomb screed, Dec. 23, the United Nations General Assembly (UNGA) overwhelmingly approved a groundbreaking resolution to begin negotiations in 2017 on a treaty banning nuclear weapons. The vote follows the October 2016 decision by the UNGA First Committee to begin work on the new treaty—a resolution that was opposed by the Obama Administration and several other nuclear-armed governments. The UN nuclear weapons “treaty ban” talks will proceed in two sessions: March 27 to 31; and June 15 to July 7. During a UN budget committee meeting last December, the US delegation under Obama fought against a funding request for the planned four weeks of negotiations. But under pressure from ban proponents Austria, Brazil, Ireland, Mexico, Nigeria and South Africa, the US withdrew its opposition and the funding was approved. The Dec. 23 UNGA resolution passed 113 to 35. Putting the lie to Mr. Obama’s 2009 promise that, “the United States will take concrete steps towards a world without nuclear weapons,” US delegate Samantha Power voted against the resolution. So did nuclear-armed England, France, Russia, and Israel. But not every nuclear state parroted Obama’s obstructionism. US partners India and Pakistan abstained, as did China. North Korea and Iran voted in favor. Saudi Arabia bucked pressure from the US, its principle arms supplier, and voted Yes. Even Italy voted Yes, despite its being a NATO partner and home to about 80 US B61 H-bombs, still deployed at two of its air force bases. The US government knows a treaty ban will demolish the manufactured perception that nuclear weapons are legitimate, while already banned landmines, gas, poison, biological and cluster munitions are not. An international ban would also make it politically embarrassing, and legally suspect, for the US and NATO to continue their nuclear war planning. In a leaked document sent to NATO members in October—before the UNGA First Committee decision—the US urged both opposition to the resolution and a boycott of the negotiations. US marching orders were disobeyed by certain allies and partners including The Netherlands, India, and Pakistan—which all abstained, and by Italy which voted Yes. The “capability” of the US nuclear arsenal is already redundant, according to Sec. of Defense Gen. James “Mad Dog” Mattis. In January 2015, Mattis denigrated the Air Force’s 450 land-based missiles, telling the Senate Armed Services Committee, “You should ask: ‘Is it time to reduce the triad … removing the land-based missiles?’” Mattis is friends with former Defense Secretary William Perry who has repeatedly called for eliminating the same missiles. They should be scrapped, Perry says, because “They’re not needed.” The same position is advocated by Gen. James Cartwright, a former Vice Chairman of the Joint Chiefs of Staff and a former commander of US nuclear forces, and by Republican Senator and later Secretary of Defense Chuck Hagel. To “greatly strengthen and expand” the indiscriminate power of H-bombs is strategically irrational, economically bankrupting, and environmentally self-destructive. The Nobel Prize-winning Physicians for Social Responsibility, which has studied the subject for four decades, reported in 2014 that just 100 nuclear warheads—if detonated—could plunge the Earth into smoke-shrouded darkness long enough to destroy agriculture and starve billions of people to death. The United States has 7,000 warheads, or 70 times the “strength” to do ourselves in. Trump would do better to greatly strengthen and expand his understanding of nuclear madness. “The issue has a particular significance for Europe where a stockpile of 180 B61s is held in six bases in five countries. If there is no change in that deployment by the time the upgraded B61-12s enter the stockpile in 2024, many of them will be flown out to the bases in Belgium, the Netherlands, Germany, Italy and Turkey. Editor’s Note: Defense attorney Kary Love of Michigan, who has repeatedly represented nuclear disarmament and Plowshares activists at trial, suggests that focusing attention on nuclear weapons’ corporate profiteers might prove effective. Kary Love writes: Despite the dedicated work of many, the business of nuclear weapons prevails. Assuming “arguendo” that enough H-bombs to destroy a rogue, criminal state actor are a necessary evil, until all nukes are eliminated, a business model based on constantly upgrading and increasing the arsenal cannot be justified. Yes this appears to be the strategy of US nuclear weapons corporations. Unless this model is derailed, political and legal barriers to disarmament have little impact. Perhaps a change of strategy would be of benefit: Rather than targeting governmental installations, consider a program focused on corporate sponsors of the infrastructure. Recall that corporate liability for enforcing slave labor and making poison for gas chambers at Nuremberg Tribunals was acknowledged. Divestiture movements, public shaming, and moral condemnation, may bear fruit from such an approach (think South Africa), in addition to boycotts of consumer divisions of guilty firms, and, since corporation charter laws usually require “operation in the public interest” charter revocation campaigns could also be launched. 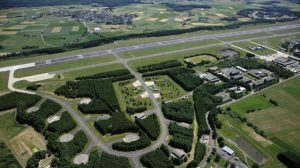 Storage bunkers at Büchel Air Base in Germany, where up to 20 US B61 free-fall nuclear bombs are deployed for use on German Tornado jet fighter/bombers. The base will be the object of 20 weeks of protest, March 26 to August 9, 2017. For 20 years, peace activists have organized protests at Büchel demanding withdrawal of the US H-bombs. A giant partnership known as Consolidated Nuclear Security Corp. (CNS) runs the Pantex bomb factory in Texas, and the Y-12 facility in Oak Ridge, Tennessee. CNS members include Boeing, Lockheed Martin, Bechtel National, Orbital ATK, and others. Boeing has designed and is producing a new tail kit for the rebuilt B61 free fall nuclear bomb with steerable fins that will radically improve target accuracy, arguably giving it new military capabilities despite denials at the highest levels of the US government. Boeing’s contract with the US Air Force is estimated to total $1.8 billion. Jay Coghlan of Nuclear Watch New Mexico tells Nukewatch that Lockheed Martin, the world’s biggest military contractor, is now at Y-12 in Tennessee and Pantex in Texas. Lockheed Martin is likely to bid again on the Los Alamos Lab (LANL) contract when that comes up in 2017, and in effect the firm is making the B61 the world’s first “smart” nuclear bomb. Sandia is the lead lab for the B61 “Life Extension Program,” which is expected to cost at least $10 billion. “It is believed that all nuclear weapons that are being rebuilt through Life Extension Programs are receiving new or rebuilt ‘secondaries,’ the thermonuclear components that put the ‘H’ in H-bomb,” Coghlan said. The secondaries are being manufactured at the Y-12 complex run by Consolidated Nuclear Security. Bechtel National says that it “puts the United States on the cutting edge of missile development.” Along with Lockheed Martin, it operates the Ronald Reagan Ballistic Missile Test Site, formerly called the Kwajalein Missile Range, on Kwajalein Atoll in the Pacific. Orbital ATK, Inc. (formerly AlliantTech Systems), headquartered in Dulles, Virginia, designs and builds missile propulsion systems, military electronics, and precision weapons, armament systems, and large- and small-caliber ammunition—including the 20-pound, 120mm, armor-piercing depleted uranium shells that travel 3000 meters in 2 seconds and contain 10 pounds of uranium-238. Honeywell, which runs the Kansas City Plant in Missouri, and was recently awarded the contract to run the Sandia Labs based in New Mexico, makes all the non-nuclear components for the nuclear warheads inside the B61 “family” including the planned B61-12. Integrated Technology Corp., based in Florida and Rhode Island, is an information management firm; while Fluor Federal Services, Inc., a wholly owned subsidiary of Fluor Corporation of Irving, Texas, provides engineering, procurement, construction, commissioning, operations, maintenance, and project management. Longenecker & Associates, Inc. is a consulting firm that provides specialized, technical and management services to nuclear industries, particularly the planning of “startup and commissioning” of nuclear systems and facilities. The B61’s final assembly is at Pantex, in Panhandle, Texas, the military’s final stop for assembly and delivery of nuclear weapons. Pantex also replaces parts and components to extend the deployment of nuclear weapons. “Today all three national nuclear weapons laboratories—Los Alamos, Sandia, and Lawrence Livermore—have contributed to the design, with Sandia acting as the ‘lead’ laboratory. The B61 was originally a LANL design,” Coghlan said. Consolidated Nuclear Security (CNS) Corp., runs both the Pantex bomb factory, Hwy 60 & FM 2373, Panhandle, TX 79068; and the Y-12 facility, Bear Creek Rd., Oak Ridge, TN 37830. Orbital ATK, HQ, 45101 Warp Dr., Dulles, VA 20166; 703-406-5000. Honeywell’s Kansas City Plant: 14520 Botts Rd., Kansas City, MO 64147; 816-488-2000; & New Mexico location, 2540 Alamo SE, Bldg A., Albuquerque, NM 87106; 505-267-4020. Fluor Federal Services Corp is headquartered near the infamous Hanford Nuclear Reservation at George Washington Way, Richland, WA 99354; 509-376-6808. Longenecker & Associates, Inc. 2514 Red Arrow Dr., Las Vegas, NV 89135; 702-493-5363. Last June, off the coast of Florida, the test of a $21 million Trident D5 missile fired from the British submarine HMS Vengeance, failed and the unarmed rocket self-destructed, but the news was kept secret from the British and US public—at the request of President Obama—for seven months. Fired toward what the Navy calls its “Eastern firing range” near the west coast of Africa, the London Sunday Times—a right-wing journal owned by the Rupert Murdoch machine—revealed in January that the test of the D5 missile, which reportedly has a range of 7,500 miles, saw the rocket fail and careen toward the US coast before spinning out into the Atlantic. The self-destruction trick is programmed to be automatic after a failure is detected, CNN reported. The Times also revealed that when the colossally expensive failure occurred in June, the Obama White House asked then Prime Minister David Cameron’s government not to comment on it publicly. The Times report was based on a British military official who spoke on condition of anonymity. The submarine Vengeance is one of four Trident subs including Vanguard, Victorious, and Vigilant. Each submarine carries 16 Trident missiles with eight nuclear warheads on each missile; 512 nuclear weapons in all. The rocket failure came just one month prior to the House of Commons vote on whether to approve a controversial $50-to-$100 billion program to replace the four missile-firing Trident subs. Under the slogan “Scrap Trident,” strong majorities of the general public, the British Labour Party, and the Scottish Parliament (Britain’s Tridents are based in Scotland) are opposed to replacement. “Unaware of the failure, members of the House of Commons voted 472 to 117 in favor of renewal,” CNN reported. Both the UK and the US have invested hundreds of billions of tax dollars in upgrading nuclear arsenals, and both are beholden to multinational conglomerates that design and build nuclear weapons and contribute generously to political campaigns and party coffers. The world’s largest arms dealer, Lockheed Martin based in Bethesda, Maryland, builds the flawed $21 million-dollar missiles. The UK’s 512 Trident missiles garner about $10.75 billion for Lockheed Martin. Catastrophic failures of such expensive weapons can prompt increased calls for their elimination. Scores of UN member states will begin negotiations March 26 in New York seeking a treaty ban on nuclear weapons, an “international convention” that both the US and UK governments have worked to derail. Britain’s long-range Trident D5 missiles are all produced and owned by the United States, which then “leases” about 512 of them to the Royal Navy—which is turn is invited to “test” them off Florida’s coast near Port Canaveral. Articles I and II of the Nuclear Nonproliferation Treaty forbid the transfer to another state, and the acceptance from another state, any nuclear weapon system. The cost of building four new ballistic-missile-firing submarines is said by the UK government to babout $49.8 billion. Britain’s Campaign for Nuclear Disarmament (CND) and other independent experts warn that the actual cost will be closer to $124.7 billion. Asked four times in January if she knew of the failure prior to the July House of Commons vote on Trident replacement July 18, 2016, Prime Minister Theresa May refused to answer, the London Telegraph reported. “I can assure the House that the capability and effectiveness of the UK’s independent nuclear deterrent is not in doubt,” British Defense Minister Michael Fallon said Jan. 23. The phrase “nuclear deterrent” is the destabilizing rationale that allows nine self-selected countries to plan and threaten to use weapons of mass destruction. Minister Fallon asserted his “absolute confidence” in the missile system, if not in his ability to keep a secret. —Sunday Times, Jan. 22 & 24; Nadia Prupis, Commondreams, Jan. 23; CNN, Jan. 23; The London Telegraph, Jan. 22; Russia Today, Jan. 22, 2017. 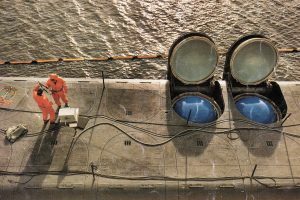 With missile hatch doors open, testing equipment aboard an Ohio class ballistic missile-firing Trident submarine. Over 500 Trident D5 long-range US missiles like these are “leased” to Britain’s Royal Navy for use on its four Trident submarines. Two nuclear submarines from rival sides in the cold war collided a few miles off the coast of Scotland in an incident that was covered up for 43 years. The potentially catastrophic crash occurred in November 1974 when the SSBN James Madison, armed with 16 Poseidon nuclear missiles, was heading out of the US naval base at Holy Loch, 30 miles north-west of Glasgow. The cable, sent by national security adviser Brent Scowcroft, said: “Have just received word from the Pentagon that one of our Poseidon submarines has just collided with a Soviet submarine. The cable was published by the CIA on January 17 as part of a mass release of more than 12 million pages of previously classified reports in 930,000 documents. The cable corroborates an until-now unconfirmed report on the incident in the Washington Post on January 1, 1975 by the investigative journalist Jack Anderson. He reported that the collision left a 9-foot scratch on the side of the James Madison and that the two submarines came within inches of sinking one another. Another document marked “top secret” released in the same batch expressed alarm that the news of the collision had leaked. It said: “On January 3, the NID [National Intelligence Daily] ran an item on the collision just off Holy Loch of US Polaris submarine and a Soviet attack submarine. Unfortunately, Jack Anderson had run the same news in the Washington Post a day or two earlier. Hudson added: “These enormous risks have to be acknowledged particularly when we also now face the increasing likelihood of cyber-attack on nuclear weapons systems. With advancing technological developments added to the already dangerous mix there can be no confidence that nuclear weapons are a credible part of British security in the 21st century. Member of Parliament Brendan O’Hara, the Scottish National Party defence spokesman, said the disclosure was “deeply worrying.” He added, “What happened in 1974 looks like a very, very lucky escape—it could have been completely devastating. “The truth is—as we saw with the Trident malfunction revelations—nothing has changed, it could happen again,” he said. “The people of Scotland live in the shadow of this appalling nuclear arsenal because Westminster puts it there—against the [wishes of the] vast majority of its elected representatives—and without taking the necessary measures to defend it or to protect the people who live here,” O’Hara said. He added: “A little under two years before the collision between an unidentified Soviet submarine and USS James Madison, another Soviet submarine, a nuclear-powered Victor class submarine, was detected in the Clyde-approach areas.